Researchers have long wondered why glia and other immune cells turn their backs on motor neurons as amyotrophic lateral sclerosis progresses. Now, they may be closer to figuring it out. Astrocytes produce transforming growth factor-β1, which deactivates microglia just when those neurons need them most, according to a paper online in Cell Reports April 16. The finding partially solves a longstanding puzzle in the field: Astrocytes were known to secrete something that caused the death of motor neurons, and TGF-β1 looks to be a component of that killer signal, said senior author Koji Yamanaka of Nagoya University in Japan. Yamanaka had previously found that astrocytes played a role in disease progression in mice carrying the mutant ALS gene SOD1. Selectively deleting mutant SOD1 in astrocytes slowed disease in those animals (Yamanaka et al., 2008). In the current work, first author Fumito Endo and colleagues focused on the anti-inflammatory factor TGF-β1 because astrocytes produce it in response to injury, and it ticks up in the blood and cerebrospinal fluid of people with ALS (Houi et al., 2002; Itzecka et al., 2002). 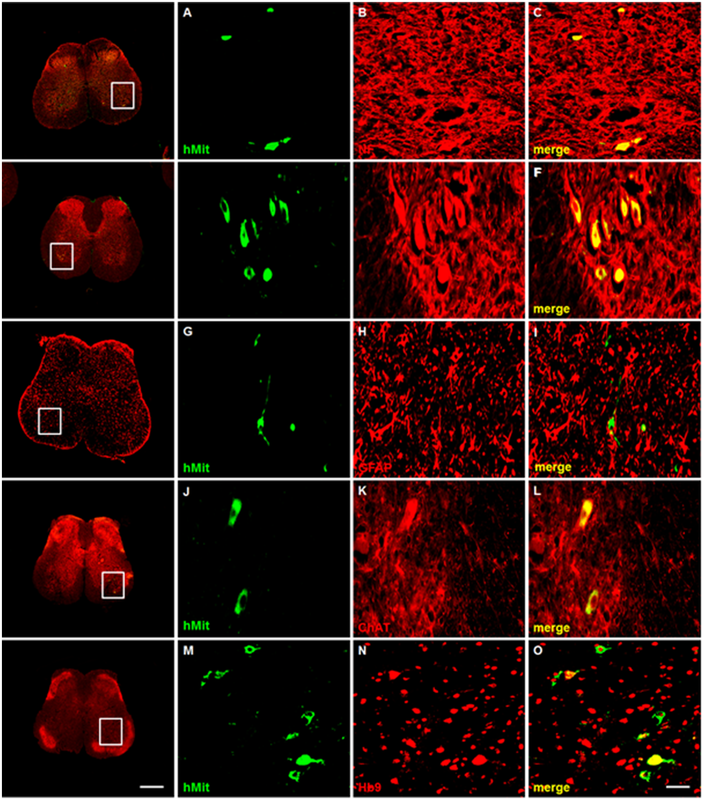 When Endo examined spinal-cord tissue from mSOD1 mice and from people who died of ALS, he confirmed that both contained more TGF-β1 than control tissue. In particular, the astrocytes were awash in TGF-β1. To examine how TGF-β1 affected the disease, Endo crossed the mSOD1 mice with a line engineered to make more of the growth factor in astrocytes. The authors predicted the growth factor might help the mice, because other studies had found that bumping up TGF-β1 signaling was neuroprotective (see Dec 2003 news; Katsuno et al., 2010). They were surprised to find the double-transgenic mice died about 10 days earlier than mSOD1 mice. TGF-β1’s effects vary with its context, explained co-author Tony Wyss-Coray of Stanford University, California. While neuronal TGF-β1 protects nerves, astrocyte TGF-β1 seems to be damaging, he said. How did astrocyte TGF-β1 make the animals worse? To find out, Endo analyzed the mRNA in the spinal cord. Compared with mSOD1 mice, the double-transgenics produced lower levels of microglial activation markers, such as CD68, and less of the neuroprotective proteins made by microglia, including insulin-like growth factor 1. This implied that TGF-β1 from astrocytes dampened microglial activation. Indeed, conditioned media from cultured mSOD1 astrocytes that overproduced TGF-β1 caused microglia to shrink and express fewer activation markers. Endo and Yamanaka did not confirm that TGF-β1 itself, rather than some other factor downstream of it, was responsible for making the microglia quiescent. Even so, they concluded that the astrocytes directly influenced microglia to be less neuroprotective. 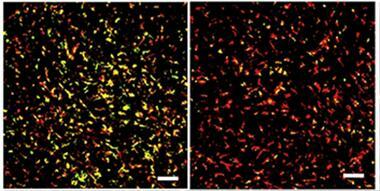 However, Endo also discovered that the astrocytes acted on microglia indirectly, via T cells. In the mRNA data, he saw that T cell cytokines, such as IL-4, were below normal levels in the double-transgenics. T cells secrete these microglia-activating cytokines when they infiltrate the spinal cord in response to stress. Flow cytometry experiments showed fewer T cells in the cords of the double-transgenics. Those T cells that did make it in expressed more interferon-γ than interleukin-4, a profile associated with microglial deactivation. From its direct and indirect effects, astrocytic TGF-β1 lulls microglia into a quiescent state, dampening their production of neurotrophic factors, the authors concluded (see model below). TGF-β1 partly, but not fully, explains how astrocytes attack motor neurons, commented Isaac Chiu of Harvard Medical School. “This paper highlights how the milieu of the neurons is important,” he said. Hemali Phatnani of the New York Genome Center agreed. “It is the entire microenvironment that is affected [in ALS], and we should be studying crosstalk not just between glia and neurons, but between the types of glial cells,” she said. Neither Chiu nor Phatnani were involved in the Cell Reports study. To test whether blocking TGF-β1 could protect against motor neuron disease, Endo injected mSOD1 mice with the small-molecule TGF-β1 inhibitor SB-431542, starting at 140 days when they were already ill. The treated mice lived nine days longer than untreated animals. This experiment used only eight mice per group, and the effect was modest but promising, Chiu said. Both he and Phatnani wanted to see more data, such as immunostaining to indicate what was happening with the mice’s T cells and microglia. Yamanaka told Alzforum the lab is working to confirm that SB-431542 treatment affects microglia and T cells in the spinal cord. He speculated that people who naturally have low levels of TGF-β1 might survive longer with ALS, while those with high levels might one day be candidates for a TGF-β1-blocker. SB-431542 is not an active investigational drug. The idea that TGF-β1, which dampens inflammation, could be damaging contradicts the conventional wisdom that neuroinflammation worsens neurodegenerative disease. “The old concept, that any inflammation is bad for you, is not holding water,” commented Terrence Town of the University of Southern California in Los Angeles, who was not involved in the work. “This paper extends the notion that there are beneficial forms of inflammation that you might not want to quash.” That may partly explain why anti-inflammatory drugs did not protect people in AD clinical trials, he said (see May 2008 news). “You really want to selectively dampen the neurotoxic portion,” said Town. The difficulty, of course, is to dissect out the desirable and the damaging portions of inflammation. “This has become the critical question in neurodegenerative disease,” Town said. 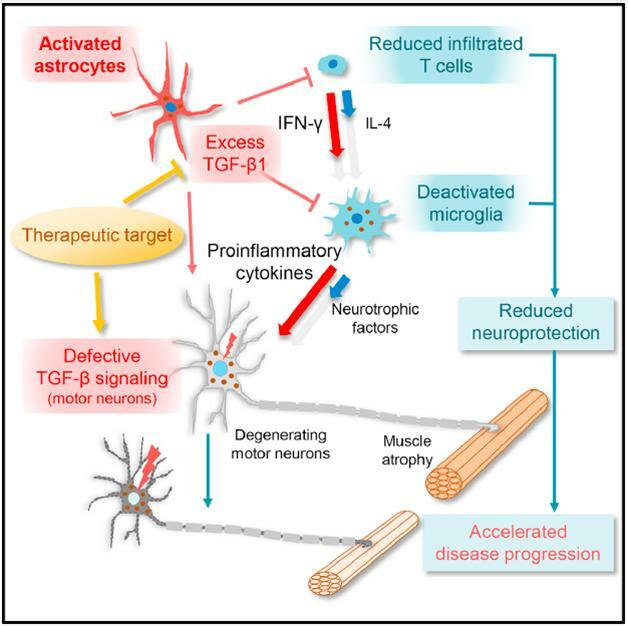 Endo F, Komine O, Fujimori-Tonou N, Katsuno M, Jin S, Watanabe S, Sobue G, Dezawa M, Wyss-Coray T, Yamanaka K. Astrocyte-Derived TGF-β1 Accelerates Disease Progression in ALS Mice by Interfering with the Neuroprotective Functions of Microglia and T Cells. Cell Rep. 2015 Apr 15; PubMed.